Managing Director Neil Capstick has always been an advocate of recruiting graduates from a variety of different backgrounds and introducing them to the world of bid writing. This can be a challenge as writing a tender requires a specific skillset, and Executive Compass works with a wide range of clients across all industries and sectors, so there is a lot to learn! With many top universities based in the region (including Durham University, Newcastle University and Northumbria University), the graduate scheme has always attracted a high number of applicants from a variety of disciplines. 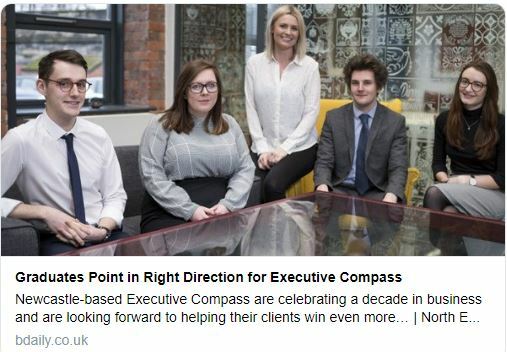 Existing members of the team, Amy and Matthew, both started with the firm as graduates over five years ago and are now part of the management team – a testament to the success of the programme. All graduates and new starters in the business take part in our comprehensive training programme. This embeds an understanding our in-house bid writing process, a background into the different industries and public sector procurement, and our tried-and-tested house style of writing. The graduates are trained intensively by MD Neil and Quality Manager Peter over the first six months of their employment and receive day-to-day support from the whole team. The office is a very open environment, with writers collaborating on projects and regular team discussions for continual improvement, with “spotlight training” being a common occurrence. The trainee writers initially shadow more experienced bid writers in the team to learn and develop their skills – from deconstructing questions, to client management and interview techniques. As our bid writing process sits within our ISO 9001:2015-certified quality management system, it is easy to follow the steps, as we approach every single bid or tender with the same level of rigour and quality. At the end of 2018 we had our latest intake of graduates: Kate, Joel and Alex. As per our recruitment process, the candidates underwent a writing test and two interviews to secure a place with the company. The writing test is crucial to understand the approach to a bid, research skills and writing flair. As we near the end of their first six months, the trainee writers are now managing tenders of their own and proving an excellent contribution to the team – we have already had a few successful tenders awarded to our clients that were written by Kate, Joel and Alex!